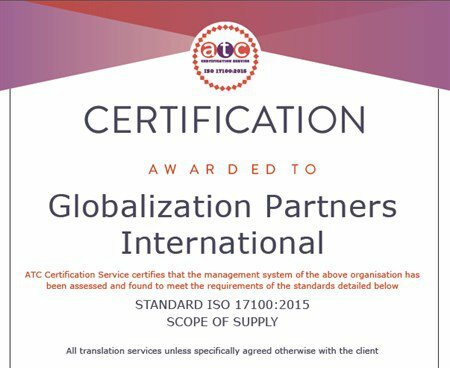 GPI is an ISO 17100:2015 certified Translation Service Provider (TSP) and has provided and passed all requirements for the core processes, resources, and other aspects necessary for the delivery of a quality translation service according to ISO standards. GPI has demonstrated conformity of its specified translation services to ISO 17100:2015 and the capability of its processes and resources to deliver a translation service that will meet its client's specifications. Globalization Partners International considers security an integral part of providing services to our clients. With the goal of safeguarding your information, we are always striving to improve security measures and implement the latest best practices for global IT infrastructure protection. All possible security precautions are taken to protect files, systems and processes, from password protecting individual files to utilization of secure intranets and extranets for staff and client interaction through fully encrypted workflows. This comprehensive approach to security management ensures that your data is safe in transit, as well as when it is stored on our servers. GPI typically secures nondisclosure and confidentiality agreements (NDA) with clients. Any and all subcontractors and/or strategic partners of GPI execute detailed NDA's AND adhere to GPI's security policies and practices before they are engaged. If your firm has specific security requirements, please let your GPI project manager know, and we will work with you to implement the specifics. Get in touch with GPI with Globalization Partners today!